Defining presenteeism is just the first problem in analysing its effects on workers. Dr Nerys Williams considers various opinions and studies. Presenteeism is a hot topic. A survey by Canada Life Group Insurance in May 2013 suggested that it is rising, with 93% of staff questioned reporting that they have attended work while ill. But presenteeism is still an emerging area of interest and one to which much less attention has been paid than sickness absence, despite increasing evidence that it is costlier. This is because presenteeism is harder to identify, define and measure, although probably not more difficult to manage. So what is “presenteeism” and is it always a negative thing that should be avoided? One problem of looking at the published literature is the many definitions used, suggesting that presenteeism is understood in different ways. This makes comparing studies and determining the underlying causes of presenteeism difficult. Researchers have variously defined presenteeism as “showing up at work when sick”, “being present at work but limited in some aspect of job performance by a health problem”, “the measurable extent to which physical or psychosocial symptoms, conditions and disease adversely affect the work productivity of those who choose to remain in work”, “working through illness and injury” and “going to work despite judging that one should have reported in sick”. The latter definition may resemble the first, but it introduces the concept of individual decision making. Presenteeism is usually described in one of three broad ways. First, it is used when people decide to go into work when they are “ill”. This includes people who would like to take time off, but are unable to for a variety of reasons such as peer pressure, poor sick pay or fear of disciplinary action. Most would agree someone who is “ill” should not be at work as there may be negative consequences for themselves and others. The employee who works when sick may ultimately take more sickness absence leave, while their colleagues may catch infections from them. In industries such as the food sector the product could become contaminated, while in healthcare the quality of service to patients is affected. Being “ill” here is not the same as having “ill health” or a “health condition”. Second, the term is used to describe the impact on productivity of someone with ill health. People belonging to the group do not want to take time off. They may have a health condition, but this does not unduly affect their work, or the condition does affect their work, but the person wishes to continue working and is able to manage the condition in the context of work demands. Third, the term can be used to describe employees who operate at less than full capacity – this describes those for whom health may be a reason, but is not the only reason, for sub-optimal performance. This may be due to lack of engagement, boredom, poor workplace relationships or disputes with line managers. In this group, discretionary effort is not being applied to the job. Looking at the second definition, the introduction of the “fit note” actively seeks to increase the number of people with this type of presenteeism as it facilitates the return to work of employees who are less than 100% fit. From the employer’s perspective it assumes that some work, even if not 100%, is preferable to none. It is this second definition that appears to be most commonly used in some of the published studies on presenteeism. Research goes back to the late 1990s with a study at a large US credit card company (Burton et al, 1999). The study used handling time per call and time unavailable to take calls as indicators of productivity and produced a “work productivity index”. This was compared with data on corporate healthcare costs and self-reported health risk appraisals and the researchers calculated that the average worker lost 4.4 hours per week from work, of which 3.8 hours were due to presenteeism and the remainder to absenteeism. Presenteeism was roughly equivalent to 10% of working time lost, or 23.4 days per employee per year. It was concluded that time lost from presenteeism was much greater than that due to absenteeism. A 2005 US study at a chemical company looked at different work impairment rates for different health conditions (Collins et al, 2005). It found that diabetes led to a 17.8% decrement in the ability to perform/function in work, whereas anxiety and stress caused a much higher 36.4% decrement. This confirmed the findings of an earlier US study on employees with a depressive disorder (Stewart et al, 2003). Given the current prevalence of common mental health conditions such as anxiety and depression in the UK, the potential impact that presenteeism may have on productivity is clear. 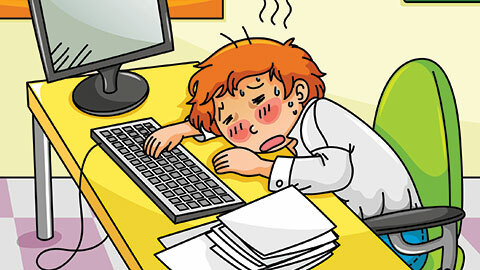 But measuring presenteeism is not easy as, unlike absenteeism, it is not clearly visible. So presenteeism tends to be measured on the basis of self-reported decrements in performance except in those few work situations where objective measures of productivity are possible such as call centres. This means that measures developed for one sector may not be suitable in another. Another limitation is the availability of employee health data to link to the productivity information. While this is readily available in the US, it is less so in the UK. That said, instruments such as the World Health Organization’s health and work performance questionnaire (HWPQ) and the Stanford Presenteeism Scale (SPS) can be used to measure the impact of health conditions on performance and productivity. The HWPQ is a self-report instrument designed to estimate the costs of health problems in terms of reduced job performance, sickness absence and work-related accidents and injuries. Workers are asked to rate the average person in their job from 0-10, rank themselves in terms of their usual performance and then rank themselves over the past 28 days. Responses are turned into scores and a ratio of actual performance to the performance of most workers in the job is produced. Health data is collected separately and then regression analysis used to compute lost productivity that is attributable to ill health. The SPS asks employees to indicate in percentage terms how less productive than usual they were in the last four weeks as a result of their health condition. This is then used, with the average annual wage of the individual’s job type, to estimate the costs of presenteeism via the work output score. Using approaches such as those described above, researchers have attempted to calculate the cost of presenteeism. The Sainsbury Centre for Mental Health estimated that the costs to employers due to presenteeism because of mental health problems to be around £605 per employee or £15.1 billion in 2007 (Sainsbury Centre, 2007). The cost to employers of absenteeism leading to mental health problems was £335 per employee, or £8.4 billion. Presenteeism therefore cost 1.8 times that of absenteeism. The Government’s Foresight Mental Capital and Wellbeing Project (2008) estimated the annual cost of presenteeism associated with mental health problems to be around £9.7 billion in the UK. This was based on US studies and the presumption of a ratio of 1.44:1 for lost working time and 1.29:1 for costs – much lower than the Sainsbury estimates. Studies frequently cost presenteeism and absenteeism together, but the link between the two is not absolutely clear. An inverse relationship may be expected in which low absenteeism, for example due to poor economic environment or limited jobs, is coupled with high presenteeism, but do we ever get situations where both indices are high or low? And do the fit note and a flexible approach to managing adaptations/adjustments lead to low absence and higher presenteeism but in a positive way? More work is needed to tease out the relationship between the two if we are to better understand and manage the links between health and productivity. Dr Nerys Williams MSc FRCP FFOM MRCGP DDAM is a consultant occupational physician. Burton WN, Conti DJ, Chen CY, Schultz AB, Edington DW. “The role of health risk factors and disease on worker productivity”. Journal of Occupational and Environmental Medicine 1999; 41(10): 863-877. Collins JJ, Baase CM, Sharda CE, Ozminkowski RJ, Nicholson S, Billotti GM, et al (2005). “The assessment of chronic health conditions on work performance, absence, and total economic impact for employers”. J Occup Environ Med. 2005. 47: 547-557. Foresight Mental Capital and Wellbeing Project (2008). Sainsbury Centre for Mental Health (2007). “Mental health at work: developing the business case”. Policy paper 8. London: Sainsbury Centre for Mental Health. Stewart WF, Ricci JA, Chee E, Hahn SR, Morganstein D (2003). “Cost of lost productive work time among US workers with depression”. JAMA 289, 3135-3144. There is no one universally agreed definition of presenteeism. This makes measuring and calculating its costs difficult. Studies that have been undertaken are largely on US populations and in sectors where measurement of loss of productivity is easier. There is little information available in sectors such as healthcare, where dealing with presenteeism could be of key importance in delivering the necessary improvements in productivity required by the harsher economic environment. Studies suggest that the time lost and cost of presenteeism far outweigh those of absenteeism and that the amount of presenteeism varies depending on the health condition or conditions. Mental health conditions appear to lead to more presenteeism than physical health conditions. Little is known about the relationship between presenteeism and absenteeism. Presenteeism does not always lead to absenteeism and absenteeism is not always preceded by presenteeism. Presenteeism is a negative phenomenon if it leads to the spread of contagious diseases, impairs the colleagues’ productivity or affects product or service quality, but having workers who are less than 100% fit undertaking part of their job at less than full capacity rather than being absent can be a positive step for both them and their employer.